Comments: This selection of the common rubber plant has unusual green and white variegated foliage. 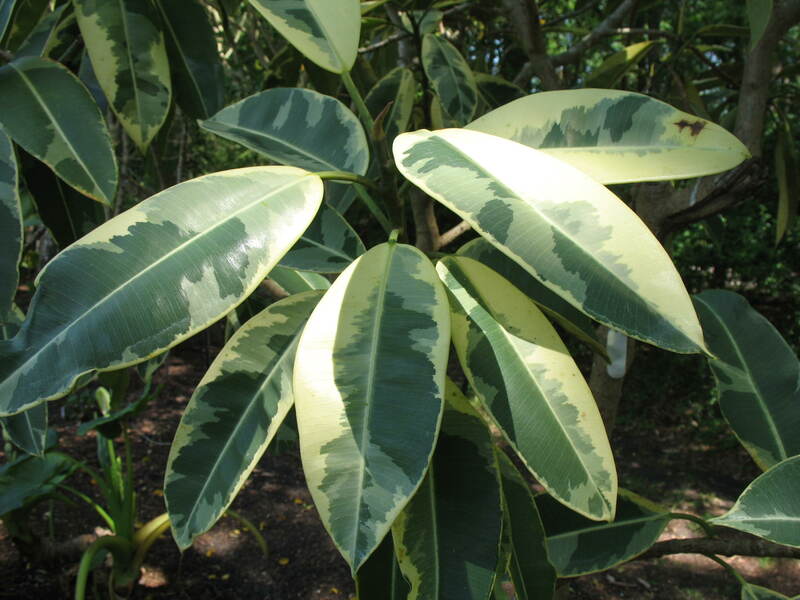 Rubber plants are popular for interior plantings, but they normally have a lot of leaf drop because of insufficient light. They need more natural light than most interior spaces can provide. Straggly plants can be cut back, repotted and placed outdoors for the summer months and they can be rejuvenated before bringing them in before winter freezes occur. Keep the soil for rubber plants only slightly moist to the touch. Fertilize only if plants are growing under good light conditions. Mealy bugs, scale insects, spider mites and aphids can be troublesome when plants are growing indoors, especially under stressful conditions.